The Kuala Lumpur Major finals ended with Virtus.pro coming on top to beat Team Secret in a best-of-five in the Dota 2 finals in Kuala Lumpur, Malaysia on Sunday. The final numbers was 3-2 in favor of Virtus.pro. Team Secret was up 2-1 in the series in which everyone thought they would end it in game 4. However, Virtus.pro had other plans, winning game 4 and forcing an inevitable game 5. Throughout the whole tournament, Team Secret hadn’t lost a game until they were beat by Virtus.pro for the first time in the series. Virtus.pro had achieved earlier success in the Kuala Lumpur Major, beating Evil Geniuses 2 – 0 and coming up from the bottom bracket in the tournament. This rally proved to be pivotal as they took what they learned from Evil Geniuses and applied their strategy in the finals. Virtus.pro shocked the audience and took game 1 away from Team Secret, a team that was on an unbeatable streak and had the advantage of momentum. But after taking away the first game, VP fell in the next two games which poised Team Secret to win the 2018 Dota 2 Finals in the Kuala Lumpur Major. With VP’s earlier win against EG, they were able to come back in the finals winning the next two games to claim the first place and collecting the tournament winnings ($350,000 1st place finish). Virtus.pro won 1st place and were dubbed Champions of the Dota 2 Finals. Team Secret picked up second place; runner up winnings were $170,000. In third place was Evil Geniuses who racked in $100,000. This is the first official Valve Major of the 2018 Dota Pro Circuit Season and Professional Gamers League’s sixth Major overall. 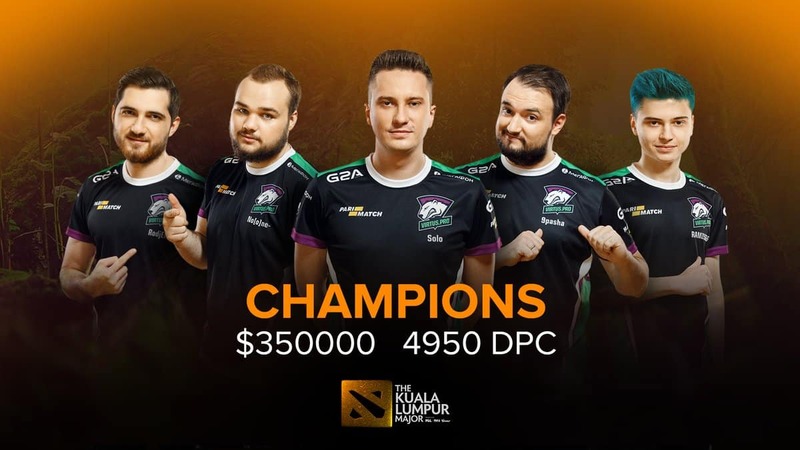 The 16-team event also awards DPC points toward The International 2019 event, in which Virtus.pro accumulated 4950 DPC points for winning the Kuala Lumpur Major. The prize pool for the finals is $1,000,000 USD.